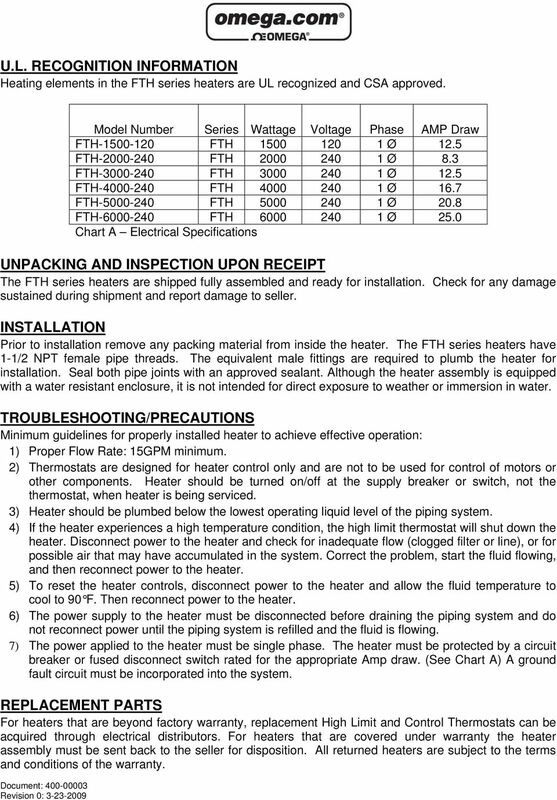 Download "FTH SERIES HEATERS INSTALLATION, OPERATION AND MAINTENANCE"
3 U.L. 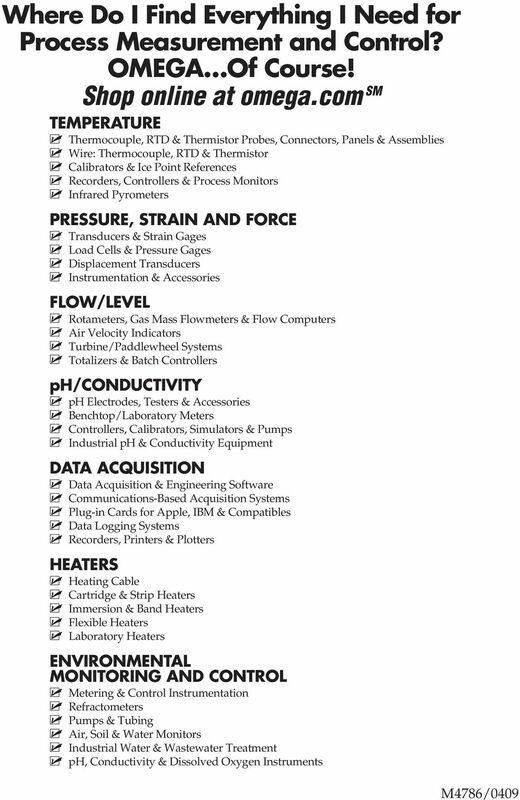 RECOGNITION INFORMATION Heating elements in the FTH series heaters are UL recognized and CSA approved. Document: Revision 0: Model Number Series Wattage Voltage Phase AMP Draw FTH FTH Ø 12.5 FTH FTH Ø 8.3 FTH FTH Ø 12.5 FTH FTH Ø 16.7 FTH FTH Ø 20.8 FTH FTH Ø 25.0 Chart A Electrical Specifications UNPACKING AND INSPECTION UPON RECEIPT The FTH series heaters are shipped fully assembled and ready for installation. Check for any damage sustained during shipment and report damage to seller. INSTALLATION Prior to installation remove any packing material from inside the heater. The FTH series heaters have 1-1/2 NPT female pipe threads. The equivalent male fittings are required to plumb the heater for installation. Seal both pipe joints with an approved sealant. Although the heater assembly is equipped with a water resistant enclosure, it is not intended for direct exposure to weather or immersion in water. 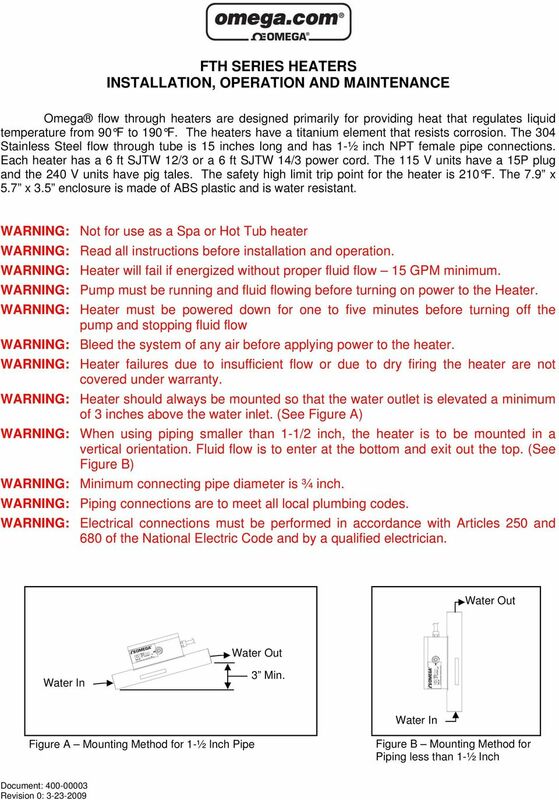 TROUBLESHOOTING/PRECAUTIONS Minimum guidelines for properly installed heater to achieve effective operation: 1) Proper Flow Rate: 15GPM minimum. 2) Thermostats are designed for heater control only and are not to be used for control of motors or other components. Heater should be turned on/off at the supply breaker or switch, not the thermostat, when heater is being serviced. 3) Heater should be plumbed below the lowest operating liquid level of the piping system. 4) If the heater experiences a high temperature condition, the high limit thermostat will shut down the heater. Disconnect power to the heater and check for inadequate flow (clogged filter or line), or for possible air that may have accumulated in the system. Correct the problem, start the fluid flowing, and then reconnect power to the heater. 5) To reset the heater controls, disconnect power to the heater and allow the fluid temperature to cool to 90 F. Then reconnect power to the heater. 6) The power supply to the heater must be disconnected before draining the piping system and do not reconnect power until the piping system is refilled and the fluid is flowing. 7) The power applied to the heater must be single phase. The heater must be protected by a circuit breaker or fused disconnect switch rated for the appropriate Amp draw. (See Chart A) A ground fault circuit must be incorporated into the system. REPLACEMENT PARTS For heaters that are beyond factory warranty, replacement High Limit and Control Thermostats can be acquired through electrical distributors. For heaters that are covered under warranty the heater assembly must be sent back to the seller for disposition. All returned heaters are subject to the terms and conditions of the warranty. 5 OMEGAnet Online Service omega.com Internet Servicing North America: U.S.A.: Omega Engineering, Inc., One Omega Drive, P.O. Box 4047 ISO 9001 Certified Stamford, CT USA Toll Free: TEL: (203) FAX: (203) Canada: 976 Bergar Laval (Quebec), Canada H7L 5A1 Toll-Free: TEL: (514) FAX: (514) For immediate technical or application assistance: U.S.A. and Canada: Sales Service: /1-800-TC-OMEGA Customer Service: / BEST Engineering Service: /1-800-USA-WHEN Mexico: En Español: 001 (203) FAX: (001) Benelux: Servicing Europe: Managed by the United Kingdom Office Toll-Free: TEL: FAX: Czech Republic: Frystatska Karviná, Czech Republic Toll-Free: TEL: FAX: France: Managed by the United Kingdom Office Toll-Free: TEL: +33 (0) FAX: +33 (0) Germany/Austria: Daimlerstrasse 26 D Deckenpfronn, Germany Toll-Free: TEL: +49 (0) FAX: +49 (0) United Kingdom: ISO 9001 Certified OMEGA Engineering Ltd. One Omega Drive, River Bend Technology Centre, Northbank Irlam, Manchester M44 5BD England Toll-Free: TEL: +44 (0) FAX: +44 (0) It is the policy of OMEGA Engineering, Inc. to comply with all worldwide safety and EMC/EMI regulations that apply. OMEGA is constantly pursuing certification of its products to the European New Approach Directives. OMEGA will add the CE mark to every appropriate device upon certification. The information contained in this document is believed to be correct, but OMEGA accepts no liability for any errors it contains, and reserves the right to alter specifications without notice. WARNING: These products are not designed for use in, and should not be used for, human applications. 6 WARRANTY/DISCLAIMER OMEGA ENGINEERING, INC. warrants this unit to be free of defects in materials and workmanship for a period of 13 months from date of purchase. OMEGA s WARRANTY adds an additional one (1) month grace period to the normal one (1) year product warranty to cover handling and shipping time. This ensures that OMEGA s customers receive maximum coverage on each product. If the unit malfunctions, it must be returned to the factory for evaluation. OMEGA s Customer Service Department will issue an Authorized Return (AR) number immediately upon phone or written request. 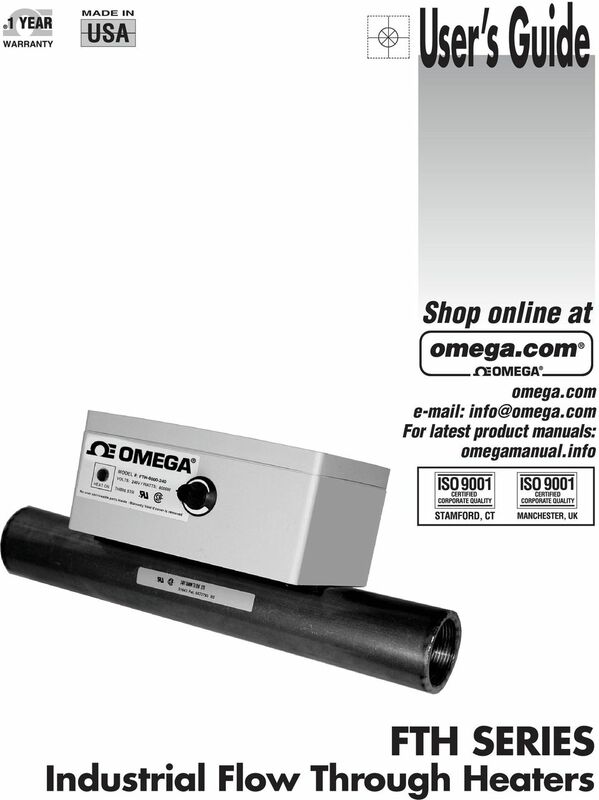 Upon examination by OMEGA, if the unit is found to be defective, it will be repaired or replaced at no charge. OMEGA s WARRANTY does not apply to defects resulting from any action of the purchaser, including but not limited to mishandling, improper interfacing, operation outside of design limits, improper repair, or unauthorized modification. This WARRANTY is VOID if the unit shows evidence of having been tampered with or shows evidence of having been damaged as a result of excessive corrosion; or current, heat, moisture or vibration; improper specification; misapplication; misuse or other operating conditions outside of OMEGA s control. Components in which wear is not warranted, include but are not limited to contact points, fuses, and triacs. 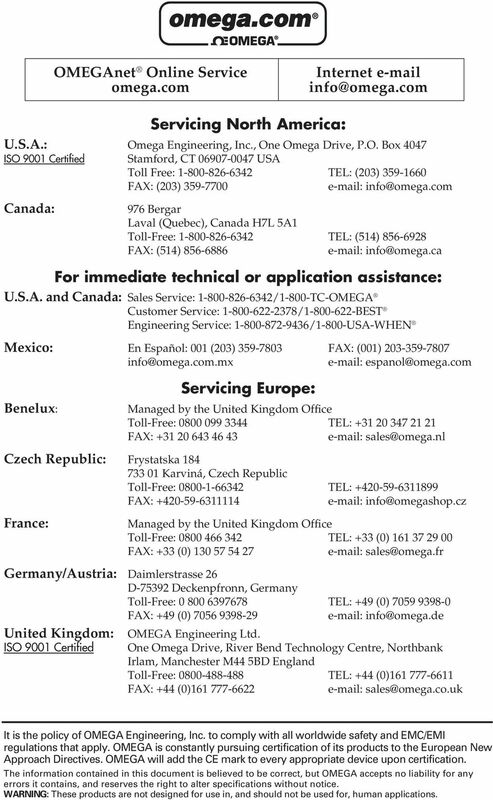 OMEGA is pleased to offer suggestions on the use of its various products. However, OMEGA neither assumes responsibility for any omissions or errors nor assumes liability for any damages that result from the use of its products in accordance with information provided by OMEGA, either verbal or written. OMEGA warrants only that the parts manufactured by the company will be as specified and free of defects. OMEGA MAKES NO OTHER WARRANTIES OR REPRESENTATIONS OF ANY KIND WHATSOEVER, EXPRESSED OR IMPLIED, EXCEPT THAT OF TITLE, AND ALL IMPLIED WARRANTIES INCLUDING ANY WARRANTY OF MERCHANTABILITY AND FITNESS FOR A PARTICULAR PURPOSE ARE HEREBY DISCLAIMED. LIMITATION OF LIABILITY: The remedies of purchaser set forth herein are exclusive, and the total liability of OMEGA with respect to this order, whether based on contract, warranty, negligence, indemnification, strict liability or otherwise, shall not exceed the purchase price of the component upon which liability is based. In no event shall OMEGA be liable for consequential, incidental or special damages. CONDITIONS: Equipment sold by OMEGA is not intended to be used, nor shall it be used: (1) as a Basic Component under 10 CFR 21 (NRC), used in or with any nuclear installation or activity; or (2) in medical applications or used on humans. 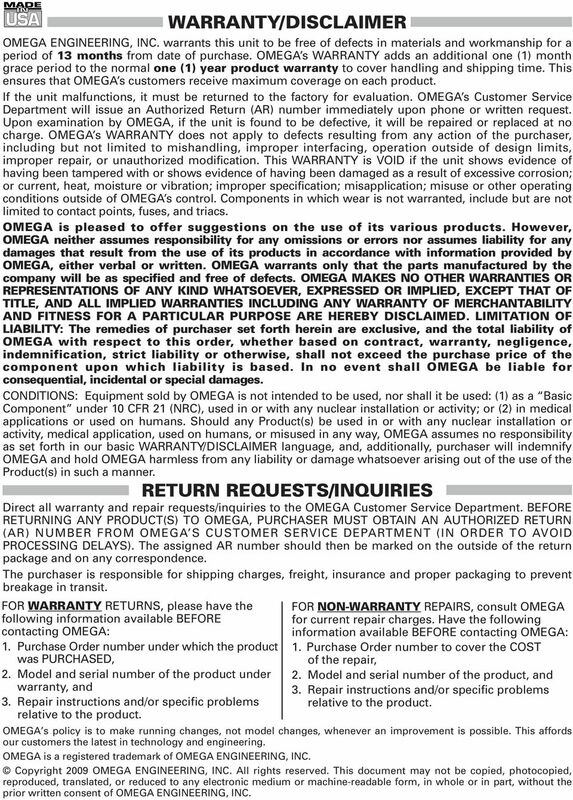 Should any Product(s) be used in or with any nuclear installation or activity, medical application, used on humans, or misused in any way, OMEGA assumes no responsibility as set forth in our basic WARRANTY/DISCLAIMER language, and, additionally, purchaser will indemnify OMEGA and hold OMEGA harmless from any liability or damage whatsoever arising out of the use of the Product(s) in such a manner. RETURN REQUESTS/INQUIRIES Direct all warranty and repair requests/inquiries to the OMEGA Customer Service Department. BEFORE RETURNING ANY PRODUCT(S) TO OMEGA, PURCHASER MUST OBTAIN AN AUTHORIZED RETURN (AR) NUMBER FROM OMEGA S CUSTOMER SERVICE DEPARTMENT (IN ORDER TO AVOID PROCESSING DELAYS). The assigned AR number should then be marked on the outside of the return package and on any correspondence. The purchaser is responsible for shipping charges, freight, insurance and proper packaging to prevent breakage in transit. FOR WARRANTY RETURNS, please have the following information available BEFORE contacting OMEGA: 1. Purchase Order number under which the product was PURCHASED, 2. Model and serial number of the product under warranty, and 3. Repair instructions and/or specific problems relative to the product. FOR NON-WARRANTY REPAIRS, consult OMEGA for current repair charges. Have the following information available BEFORE contacting OMEGA: 1. Purchase Order number to cover the COST of the repair, 2. Model and serial number of the product, and 3. Repair instructions and/or specific problems relative to the product. OMEGA s policy is to make running changes, not model changes, whenever an improvement is possible. This affords our customers the latest in technology and engineering. 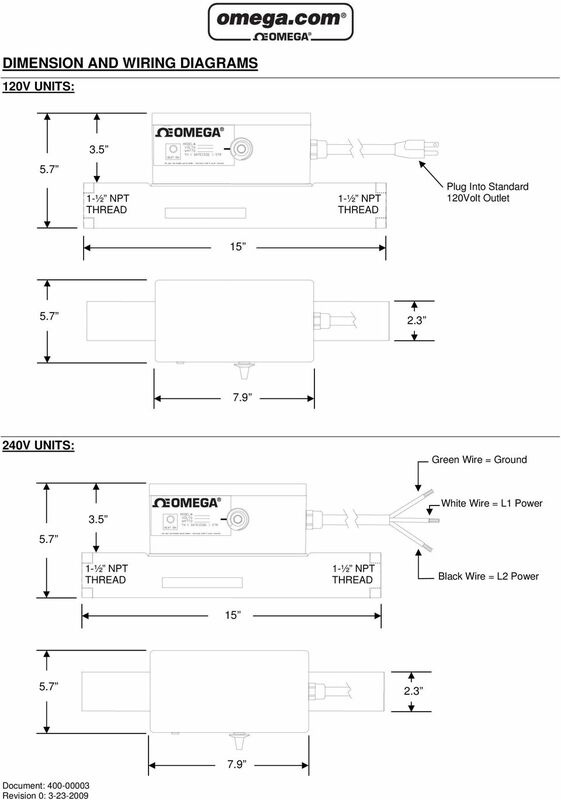 OMEGA is a registered trademark of OMEGA ENGINEERING, INC. Copyright 2009 OMEGA ENGINEERING, INC. All rights reserved. This document may not be copied, photocopied, reproduced, translated, or reduced to any electronic medium or machine-readable form, in whole or in part, without the prior written consent of OMEGA ENGINEERING, INC.
1 HP Swimming pool PUMP 67333 Set up and Operating Instructions Visit our website at: http://www.harborfreight.com Read this material before using this product. Failure to do so can result in serious injury. 1.5. Precautions Drain the moisture from the tank daily to help prevent corrosion.